Our Planet and Humanity are rapidly approaching a significant ascension to a higher dimension. Some of us are already on the path of moving up. Do you feel you are ready? 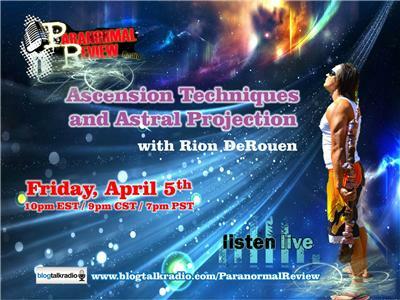 Light Warrior, Rion DeRouen will be our guest this Friday, April 5 to share with us some basic ascension techniques we all could use for our health, our heart, our soul, and our higher being to help get us ready for the next major universal change. Rion will also discuss Astral Projection and how we all have the power to do this technique. Rion has some great insight and tools we can use to astral project. Get ready fellow star seeds for a mind blowing experience!